Lil' Bits "Nuptials" contains many more unique digital elements that you will want and need to create memorable wedding invitations, cards and wedding album layouts. 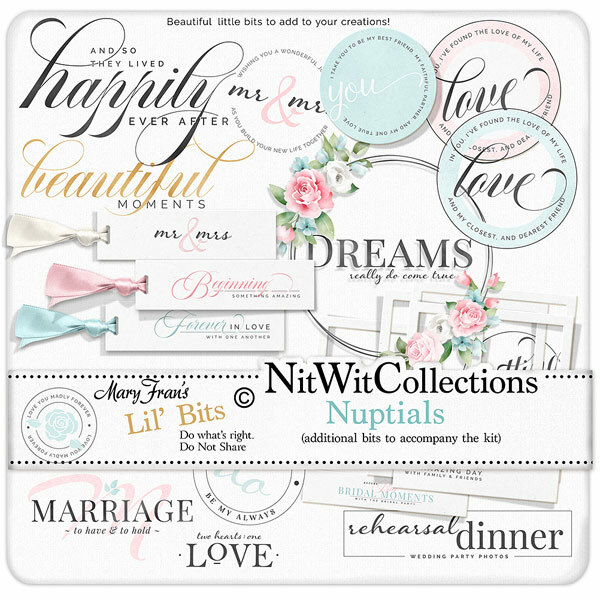 Don't miss out on these digital elements as they are not included in the FQB "Nuptials" Collection so please don't miss out on owning and creating with these elements! 1 Circle label - "I Take You To Be..."
1 Circle label - "In You, I've Found..."
1 Digital stamp - "Cutting the Cake"
1 Digital stamp - "Wishing You A Wonderful Journey...."
1 Digital stamp - "In You, I've Found the Love...."
1 Digital stamp - "Two Hearts: One Love"
1 Digital stamp - "Love You Madly Forever"
1 Digital stamp - "We Do...."
1 Digital stamp - "Rehearsal Dinner"
1 Digital stamp - "Marriage - To Have and To Hold"
2 Wreath elements with soft floral accents....one blank for your sentiments and one already completed for you - "Dreams Really Do Come True"